Today you'll find an ever-expanding array of gardening tools available, but you don't need to have them all. However, a few must-have tools will make many garden chores easier. Unless you have a pet gopher to dig your planting holes, you'll surely need a shovel. Don't forget the hoe-an essential tool for tilling and weeding. And you'll need to water. Do you have a hose and sprinkler? Also, no gardener should be without a good pair of pruners and gardening gloves. You generally get what you pay for when buying garden tools such as shovels, trowels, and pruners. High quality tools can last for years with proper care. Cheap tools eventually break and have to be thrown away. It pays to invest in garden tools that will last. Buy the best tools you can afford. Try out garden tools before you buy them. Make sure they fit you comfortably and will suit your needs. Smaller, lightweight garden tools are available and work well for light tasks. For heavier jobs, look for heavy duty tools with blades or tines made of forged or stainless steel. 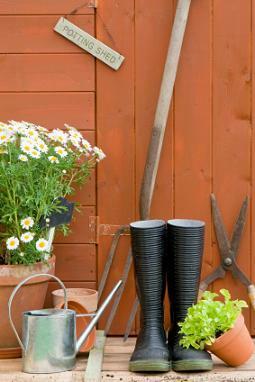 If you take the time to maintain your Gardening tools, they'll work better and last longer. Clean your tools after each use. Sharpen your tools periodically or take them to a hardware store to have them sharpened. Sterilize cutting tools with bleach or hydrogen peroxide between uses. Lubricate your tools to keep them from rusting. An easy way is to add some oil to a bucket of sand. Plunge metal tools into the bucket after each use. Alternatively, wipe the blades with linseed oil between uses. A hose is a necessity when it's hot and you have a garden to water. Buying a quality hose that lasts for many years is more cost effective than buying a cheap one that only lasts a year or two. Look for a heavy-duty hose with a warranty. Depending on your needs, you may also choose a light-weight hose, a small coiling hose, or a soaker hose. Even if you're the kind of person who likes to get your hands dirty, at times gloves come in quite handy. After one run-in with poison ivy or stinging nettles, you'll never leave the house without gloves. And your fingernails will stay much cleaner because of it. Cloth gloves are cheap and breathable and they wash well. For more protection from prickly plants, look for gloves with latex or rubber fingers and palms. Heavy duty leather gloves also offer a lot of protection. Whatever gloves you choose, make sure they fit comfortably and that you can move your hands easily.